What did our Framers really say we must do when the federal government usurps power? They never said, “When the federal government ignores the Constitution, amend the Constitution”. First, let’s look at the Constitution we have. With all other powers reserved by the States or the People. We listed every power we delegated to the federal government: Most of the powers delegated over the Country at large are listed at Article I, §8, clauses 1-16. It is only with respect to the enumerated powers listed in the Constitution that the federal government has lawful authority. If it’s on the list, Congress may make laws about it. But if it’s NOT on the list, Congress usurps power & acts unlawfully when it interferes. Is “education” on the list of delegated powers? Raising children? Health Care? Environmental regulation? Is most of what they do on the list? Since these are not delegated powers listed in our Constitution, the federal government usurps power and acts unlawfully when it meddles. So then, what do we do when the federal government usurps powers not on the list? States must defend themselves from the federal government – that’s why the People are armed. State Governments Must Man Up and Preserve our Constitution. The Declaration of Independence says at the 7th para that the colonials “opposed with manly firmness” the King’s “invasions on the rights of the people”. To allow terminally ill people access to experimental drugs & medical treatments despite FDA rules – drugs & medical treatments are not on the list! And the 10th Amendment didn’t stop them from usurping powers in this area. Deny resources and assistance to the National Security Agency – spying on us is not on the list! And the 4th Amendment didn’t stop them from spying on us! Nullify federal bans on growing hemp & marijuana. Agriculture and drugs are not on the list! And the 10th Amendment didn’t stop them from usurping powers in this area. An Indiana Legislator filed a bill to nullify all federal EPA Regulations – environmental protection is not on the list! And the 10th Amendment didn’t stop them from usurping power over the environment. Disarming the American People: If Congress by law, or the President by executive order, or the BATF by rule, or the supreme Court by opinion, or the federal government by UN Treaty, orders The People to turn in our arms, We must refuse to comply. The Constitution doesn’t authorize the federal government to disarm us. Gun control is not on the list! And the 2nd Amendment didn’t stop them from regulating ammunition, firearms, and firearms dealers. Accordingly, States should pass laws directing their firearms and ammo dealers to ignore all federal dictates which pretend to restrict arms, firearms, ammo, and sales of same. The Law should also provide that the State Attorney General will defend any Citizen of the State from unlawful acts committed against him by agents of the federal government attempting to enforce unconstitutional federal dictates within the borders of the State. Prayer in the Public Schools: When, in 1962, the US supreme Court began its war against Christianity by banning prayers in the public schools, State legislatures should have passed laws directing their public schools to ignore the unconstitutional opinion of the supreme Court. “Religion”, “prayers”, and “public schools” are not on the list of delegated powers. And the 1st Amendment didn’t stop them from “prohibiting the free exercise of religion”. Brave Citizens Must Man up Also. As noted above, Madison says in Federalist No. 46 that the People can refuse to cooperate with federal officers. Rosa Parks & Martin Luther King showed us spine 50 years ago when they nullified the State & local Jim Crow laws by refusing to obey those unconstitutional laws. If you are a “Citizen”, you have the right to bear arms – that’s all you need in Connecticut. So the Connecticut Statute making it a felony to possess guns which are not registered is unconstitutional as in violation of Art. I, § 15 of the State Constitution. And The People – as the creators of the State government – are the ones to ultimately decide! The “we lost the civil war” objection to Nullification. The southern States were agricultural. They bought manufactured goods from England. England bought southern cotton. Infant industries in the North East were producing some of the same manufactured goods as England; but because they were more expensive than the imports, they couldn’t compete. So in 1828, Congress imposed a high tariff on the imports. The Southern States called this the “tariff of abominations”, because it made the English goods too expensive to buy; and when the Southern States stopped buying English goods, England stopped buying Southern cotton. This devastated the Southern economy. Note that Congress has specific authority to impose tariffs on imports: Art. I, § 8, cl. 1. So the Tariff Act of 1828 was constitutional. The nullification is presumed valid unless ¾ of the States say it isn’t valid. Nullification is not a constitutional right. Your Duty is to read our Declaration of Independence and Constitution and learn The List of Enumerated Powers. YOU were supposed to enforce the Constitution with your votes. But instead of supporting only candidates who knew and obeyed our Constitution, you abdicated your Responsibility and voted for candidates who told you what you wanted to hear. For the Sake of your Country and Posterity, you must also renounce cowardice and appeasement as the response to evil. If you fail us, hell on Earth is just around the corner. We must start electing candidates who know the Constitution! 2 THIS Chart lists the enumerated powers over the Country at Large and illustrates how Principles in our Declaration of Independence were implemented in our Constitution. 3 Stop quibbling over terminology. As a People, we have lost the ability to think conceptually. When some don’t see the word, “nullification”, in a writing, they insist the writer didn’t support it. But the concept is refusal to submit to unconstitutional laws. You can call it “non-violent civil disobedience”, “that original right of self-defense”, “resistance”, “refusal to obey”, “impeding & obstructing”, “nullification”, “interposition”, or something else. I use “nullification” because the term has a distinctive meaning and was used by our beloved Thomas Jefferson. You may call broccoli “broccoli”, a “green vegetable”, a “cruciferous vegetable”, a “super food”, or “little trees”. But “broccoli” is the most precise and distinctive term. Do you see? 4 So when Michael Farris, and others who tell us a convention is the only way out, disparage nullification as an “extra-constitutional doctrine”, the proper response is: Nullification is NOT a “constitutional right or remedy” – it is that NATURAL RIGHT of self-defense which pre-dates and pre-exists the Constitution. Farris has repudiated our Founding Principles that Rights come from the Creator God, and that the purpose of government is to secure the Rights GOD gave us (Declaration of Independence, 2nd para). In Farris’ brave new world, “rights” come from the Constitution – where they are subject to the will of human governments. 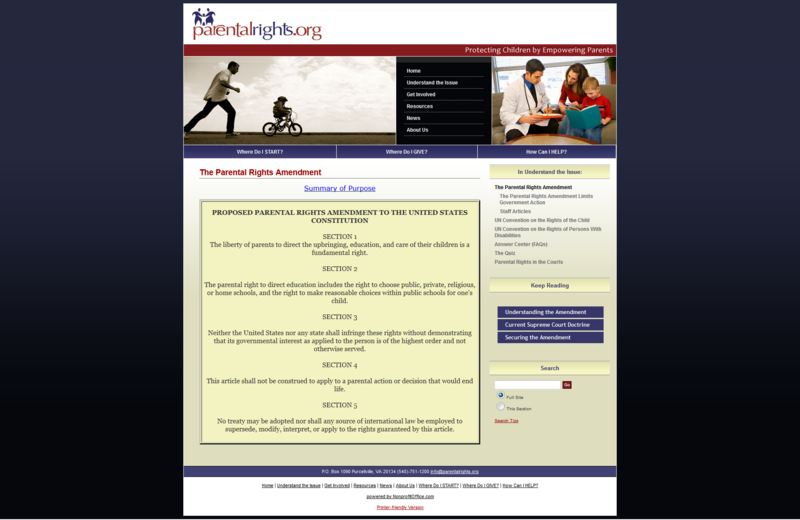 See, e.g., his so-called “parental rights” amendment HERE. “Child raising” is not now on the list of delegated powers – but §3 of Farris’ “parental rights” amendment would delegate power over children to the federal government. Read it.